More than 100 artists from across the country issued a joint statement-plea on 8 April to vote "against hate politics" and "usher in a new and inclusive government that respects democracy and secular values" in the run-up to the 17th Lok Sabha elections. Delhi-based multi-disciplinary artist Ranbir Kaleka was one of the signatories. This should not come as a surprise. Especially if seen in light of Kaleka's latest solo exhibition titled 'In Fear Of A New Dawn'—a brooding collection of video art installations which feature juddering islands, gray balls of tumbleweed, a coffin-like block of burnt wood, among other spectral images like the severed head of a donkey and doppelgangers staring and merging into each other. Kaleka, who earlier stood out for his painterly practice of the fantastic and the surreal, has mastered the art of combining paintings with video projections and haunting sound in the last fifteen years. But by his own admission, he is a slow artist—taking his time to produce works and locating the right protagonists for his video and digital works. The current exhibition accordingly speaks to this go-slow, contemplative work ethic, where no more than six video installations are spread across two floors of Vadehra Art Gallery.  Even so, the guttural soundscape reverberating through the halls easily mount to a fright, lending further credence to the meaning and message of the title. In manages to deliver the scares and is testament to the artist's abiding preoccupation with theatre, film-making and literature. 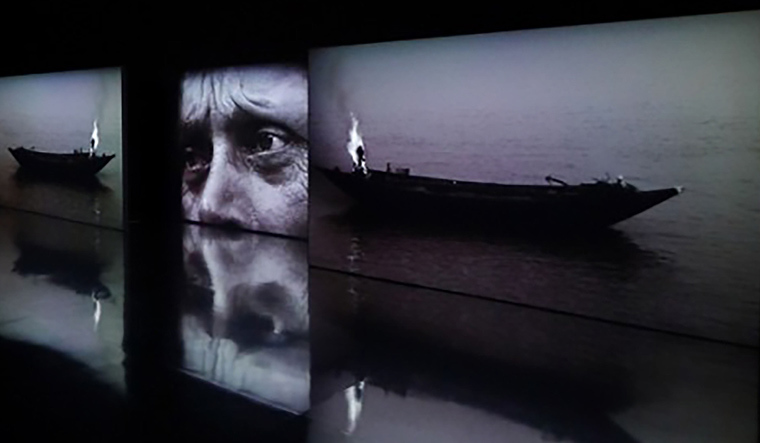 In the three-channel video House of Opaque Water (2012), the protagonist is Sheikh Lal Mohan. He is a victim of rising sea levels which have swallowed his island-home in the Sundarbans. He defiantly points to an endless expanse of water and declares: “This is my home”, even though he is a castaway. Perhaps the most unsettling is the Fearsome Acquiescence of a Monotonous Life, a two-channel video installation with sculpture, essentially an architectural structure invoking both the haveli in Punjab where Kaleka grew up, and a bioscope, a proto-cinematic device. Through one of the windows, we see a video of tumbleweed balls rolling on the ground in front of the door of a house. The other window shows a man watching himself walking into the house and into himself, in an endless loop. 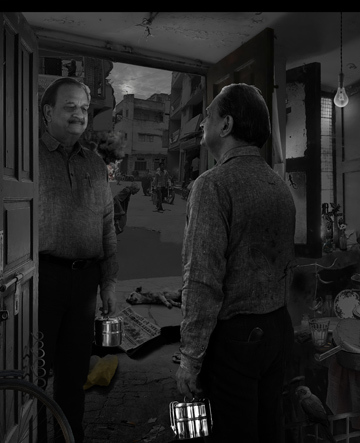 The digital collage-painting The Unremarkable Life of The Man With Tiffin, in which a violent event unfolds in the street outside, a man finds his doppelganger staring at him from across the threshold of his house. In a recent interview in Indian Express, Kaleka was quoted as saying, "My uncle once commented on how intelligent they (donkeys) were, how they helped build towns and cities that became great civilisations. To me, they seemed to be mistreated. In one of the works in this exhibition, we see the severed head of a donkey which bleeds every time some innocent unwary victim falls to random but insidiously fired arrows." This work refers to Not Anonymous: Waking to the Fear of a New Dawn, a video projection on six surfaces at various depths. It shows a half-visible man randomly riddled with arrows shot by an archer. And in Bound, a black and white image of a prostrate man is projected on a block of charred wood. He is at once convulsed with seizures while at other times struggles to pull out from his pocket a piece of folded paper which is blown away by the wind. The 66-year-old artist was trained at College of Art, Chandigarh, and the Royal College of Art, London. His works have been exhibited in multiple international galleries and museums. 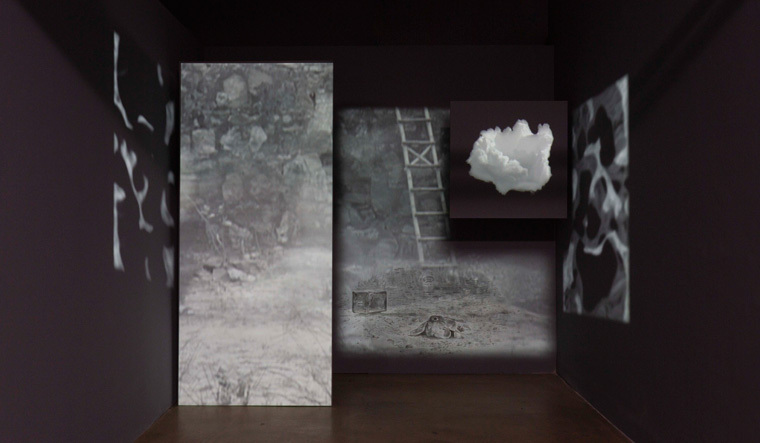 In 2007, Kaleka was commissioned to make a Holocaust memorial, resulting in a site-specific video installation titled 'Consider', which consisted of two projections, a painting and an audio narrative of oral testimony from Auschwitz. He has also showed at the 51st Venice Biennale and the Kunsthalle, Vienna, Austria. 'In Fear Of A New Dawn' is on view till 13 April at Vadehra Art Gallery in Delhi.